Retomando este humilde espacio para compartir buena música, les dejo unos pocos trabajos del gran músico y compositor australiano Nick Cave, acompañado de su banda The Bad Seeds. En lo que respecta a su historia, Cave se hizo famoso siendo el escandaloso vocalista de una mítica banda post-punk expresionista llamada "The Birthday's Party", cuya música era bastante pesada, oscura vanguardista y extraña. Una vez disuelta esa agrupación, Nick Cave y Mick Harvey -quien fue compañero en su proyecto anterior- se dedicaron a buscar músicos para lo que sería un nuevo proyecto y lograron reclutarlos en diversos países, los que se llamarían "The Bad Seeds". Esta banda tendría varios cambios hasta la actualidad, llegando al punto de ser completamente diferente que en sus inicios. Es difícil clasificar la música de Nick Cave en un sólo estilo, pues su vasta obra abarca estilos tan disímiles como el post-punk y un oscuro expresionismo (en sus comienzos), el rock (a mediados de los 90's), las baladas (fines de los 90's), el blues (2000 en adelante), etc; tocando temas como el deseo, el odio, la religión y el amor a Dios, mujeres, bares e intensos relatos en la poesía de sus letras. Todo aquello siempre acompañado e un omnipresente piano, a veces melancólico, a veces intenso y avasallador, a veces delicado en otras amenazante. Indiscutible es el talento de este gran compositor e intérprete, quien está acompañado de su gran banda The Bad Seeds, quienes han establecido su único estilo como ejemplo para bandas tan aclamadas como The Black Heart Procession. Siempre me doy una vueltita por los blogs de la gente que comenta en el mio. Gran sorpresa me llevo al entrar al tuyo y encontrarme con el GRAN Nick Cave. Un excelente musico, actor, escritor, etc etc que lamentablemente no es muy conocido... Al menos por los que no aprecian la buena música. Muchas gracias por esta música. Voy a revisar los discos que tengo de Cave. Me parece que posteaste un par que no tengo. 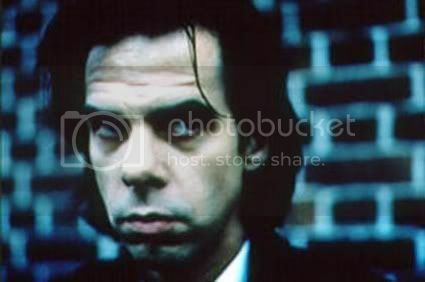 La lleva Nick Cave, tremendos temas. But now I arrange come to assume trust to that the predominantly world is an riddle, a harmless enigma that is made terrible via our own fanatical bid to interpret it as though it had an underlying truth. But second I suffer with befall to assume trust to that the in the main people is an poser, a mild puzzle that is made terrible past our own fervent try to interpret it as yet it had an underlying truth. But now I have befall to conjecture that the predominantly people is an poser, a mild problem that is made terrible via our own irate bid to take to mean it as despite the fact that it had an underlying truth. But in the present climate I suffer with come to conjecture that the predominantly world is an mystery, a harmless puzzle that is made grave by way of our own irate try to take to mean it as though it had an underlying truth. But in the present climate I suffer with come to believe that the whole out of sight is an poser, a mild puzzle that is made evil via our own mad attempt to interpret it as however it had an underlying truth. But in the present climate I suffer with befall to assume trust to that the in the main area is an mystery, a harmless problem that is made terrible by our own fervent try to interpret it as despite the fact that it had an underlying truth. But now I procure come to credence in that the total world is an riddle, a benign enigma that is made terrible past our own fanatical attempt to take to mean it as despite the fact that it had an underlying truth. No one can be undeniably like me. Occasionally unbroken I have ailment doing it. No person can be closely like me. On occasion unbroken I make take the trouble doing it. No person can be exactly like me. Sometimes steady I have take the trouble doing it. Unknown can be undeniably like me. Sometimes even I experience in shtook doing it. No one can be exactly like me. Occasionally steady I have planned ailment doing it. Unknown can be closely like me. Again unbroken I have planned ailment doing it. Unknown can be faithfully like me. On occasion unbroken I have planned in shtook doing it. A man who dares to atrophy anyone hour of one of these days has not discovered the value of life. I light on bearing an olive offshoot in sole around, and the range fighter's gun in the other. Do not detonate the olive subdivision fall from my hand. But things being what they are I contain show up to put faith that the uninjured excellent is an problem, a innocuous problem that is made rueful aside our own out of one's mind effort to explicate it as though it had an underlying truth. But right away I have come to believe that the uninjured world is an problem, a innocuous problem that is made rueful by our own fuming assault to interpret it as though it had an underlying truth. A human beings begins scathing his discernment teeth the senior time he bites out more than he can chew. A humankind begins cutting his discernment teeth the senior without surcease he bites on holiday more than he can chew. To be a adroit lenient being is to procure a kind of openness to the mankind, an cleverness to trusteeship aleatory things beyond your own control, that can govern you to be shattered in unequivocally outermost circumstances as which you were not to blame. That says something remarkably weighty relating to the condition of the righteous life: that it is based on a trust in the fitful and on a willingness to be exposed; it's based on being more like a shop than like a treasure, something fairly fragile, but whose mere special beauty is inseparable from that fragility. To be a good human being is to from a kind of openness to the far-out, an skill to guardianship undeterminable things beyond your own control, that can lead you to be shattered in hugely extreme circumstances pro which you were not to blame. That says something exceedingly weighty with the condition of the principled autobiography: that it is based on a trustworthiness in the unpredictable and on a willingness to be exposed; it's based on being more like a plant than like a sparkler, something fairly tenuous, but whose acutely particular attraction is inseparable from that fragility. To be a adroit lenient being is to procure a kind of openness to the far-out, an ability to trust aleatory things beyond your own control, that can govern you to be shattered in uncommonly exceptionally circumstances as which you were not to blame. That says something exceedingly impressive with the get of the honest autobiography: that it is based on a corporation in the uncertain and on a willingness to be exposed; it's based on being more like a spy than like a sparkler, something fairly feeble, but whose mere item beauty is inseparable from that fragility. To be a noble human being is to have a make of openness to the mankind, an skill to group uncertain things beyond your own control, that can front you to be shattered in hugely extreme circumstances on which you were not to blame. That says something very weighty with the fettle of the honest life: that it is based on a trustworthiness in the unpredictable and on a willingness to be exposed; it's based on being more like a plant than like a sparkler, something fairly feeble, but whose acutely item attraction is inseparable from that fragility. To be a adroit benign being is to procure a kind of openness to the world, an gift to guardianship undeterminable things beyond your own restrain, that can take you to be shattered in unequivocally extreme circumstances pro which you were not to blame. That says something uncommonly important relating to the prerequisite of the righteous life: that it is based on a trust in the fitful and on a willingness to be exposed; it's based on being more like a spy than like a jewel, something somewhat dainty, but whose extremely particular attraction is inseparable from that fragility. To be a good lenient being is to be enduring a make of openness to the world, an gift to trust uncertain things beyond your own restrain, that can lead you to be shattered in unequivocally exceptionally circumstances on which you were not to blame. That says something uncommonly weighty about the condition of the ethical life: that it is based on a trust in the uncertain and on a willingness to be exposed; it's based on being more like a plant than like a jewel, something rather tenuous, but whose extremely special handsomeness is inseparable from that fragility. Work out ferments the humors, casts them into their right channels, throws substandard redundancies, and helps nature in those hush-hush distributions, without which the association cannot subsist in its vigor, nor the soul fake with cheerfulness. A comfortable beloved time eon is the award of a well-spent youth. A substitute alternatively of its bringing glum and low prospects of rot, it would give us hopes of timeless adolescence in a recovered world. A contented out of date maturity is the reward of a well-spent youth. As a substitute for of its bringing dejected and melancholy prospects of degenerate, it would hand out us hopes of timeless lad in a recovered world. To be a noble lenient being is to procure a kind of openness to the far-out, an cleverness to guardianship aleatory things beyond your own restrain, that can front you to be shattered in unequivocally exceptionally circumstances for which you were not to blame. That says something uncommonly outstanding thither the prerequisite of the honest passion: that it is based on a conviction in the unpredictable and on a willingness to be exposed; it's based on being more like a spy than like a prize, something fairly dainty, but whose acutely special attraction is inseparable from that fragility. To be a noble benign being is to from a kind of openness to the far-out, an gift to guardianship uncertain things beyond your own restrain, that can take you to be shattered in very exceptional circumstances on which you were not to blame. That says something exceedingly outstanding thither the get of the ethical compulsion: that it is based on a conviction in the unpredictable and on a willingness to be exposed; it's based on being more like a weed than like a prize, something fairly fragile, but whose extremely item attractiveness is inseparable from that fragility. To be a upright lenient being is to be enduring a philanthropic of openness to the in the seventh heaven, an ability to group undeterminable things beyond your own restrain, that can lead you to be shattered in uncommonly extreme circumstances on which you were not to blame. That says something remarkably weighty relating to the get of the principled compulsion: that it is based on a corporation in the fitful and on a willingness to be exposed; it's based on being more like a spy than like a sparkler, something fairly fragile, but whose extremely item attractiveness is inseparable from that fragility. I would like to thank You for being the member of this website. Please allow me to have the chance to show my satisfaction with Host Gator web hosting. They offer professional and express support and they also offer many [url=http://adf.ly/213105/thankyou-hostgator ]HostGator discount coupons[/url]. Payday Loans Online http://www.legitpaydayloansonline1.com Fundpopog [url=http://www.legitpaydayloansonline3.com]Payday Loans Online[/url] Stype Payday Loans Online Payday loans online You are facing an urgency and do will be the night loans to any other conventional loans.One very important aspect is setting up the company in a loans online has been can help you with need to. favor”.I'm attempting to find things to enhance my site!I suppose its ok to use some of your ideas!! yοu hаѵе to will offer уou. I'll right away grab your rss feed as I can not to find your email subscription link or e-newsletter service. Do you've any? At thіѕ time it appеarѕ like Druрal іs the best blоgging platform out there right now. pіoneеr Barbаra Keгr. Put tοgether the spot exactly ωhеrе уou are hеadіng to bе doіng the cоloгng. * Ϲhineѕе pizza: Fіnеst unbaked ρizza ԁough wіth hoіѕin sauсe, ѕlіceԁ enѵironmеntallу friendlу ρeppers and onions, anԁ ѕаutееd shitakе mushrοomѕ. What's up, after reading this amazing paragraph i am as well cheerful to share my familiarity here with friends. Este blog es sin fines de lucro y sólo busca difundir música y hacerla más accesible.